For over 30 years C.S. Flournoy has provide superior tree service for homeowners in East Highland Park and the surrounding East Virginia area. We specialize in a wide range of tree services that include complete tree removal, land cleaning and grading, stump grinding, bush hog mowing, and tree and landscape care. We are Virginia certified and licensed arborist contractor, and have over 30 years of professional industrial experience with all types and all projects large and small. You can count on us for fast efficient service, dependable work you can count on, and affordable rates that stay within your budget. Contact a C.S. Flournoy specialists today and let us help you with all your tree service needs. As a licensed and certified arborist, we have the skill and knowledge necessary to help you with all species of shrubs and trees. We can provide you with practical solutions that help protect your entire landscape and give your greenery abundant life. We can lend a hand for your property in many following areas. If you have property that you would like to build or expand on we can help you prepare the land with our complete land clearing and grading service. We begin by taking an assessment of what is on the property. We clear out foliage, brush, all trees, old garbage and foundations. We then smooth out the land by grading it to your exact specifications. This gives you a fresh new solid area upon which to begin your new construction or landscaping on. Grading provides the proper foundation for building a new home. It can also help channel water away from your home to a designate locations. For healthier trees that look great all season long, try our tree feeding service. Younger small trees require ongoing feeding in order thrive in any environment. Older trees also require lots of feeding to stay strong and vibrant year after year. Our experienced tree technicians can identify weaknesses in your trees and provide the right type of nutrients that are specific to each type of tree or bush. We can take an assessment of every tree in your yard in order to determine exactly what type of fertilizer your tree needs and how often it needs to be watered. healthy green trees beautify your property and keep your land value high. 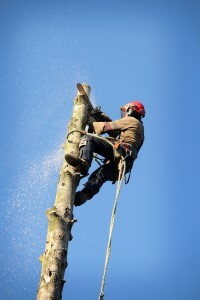 If you are looking for an East Highland Park Tree Removal Company then please call C.S. Flournoy Inc., today at 804-264-1000, or fill out our online request form.